The History Blog » Blog Archive » These. Are. Looters! Greek police have seized an ancient sculpture still in caked in the soil from which it was recently looted and arrested the looters. 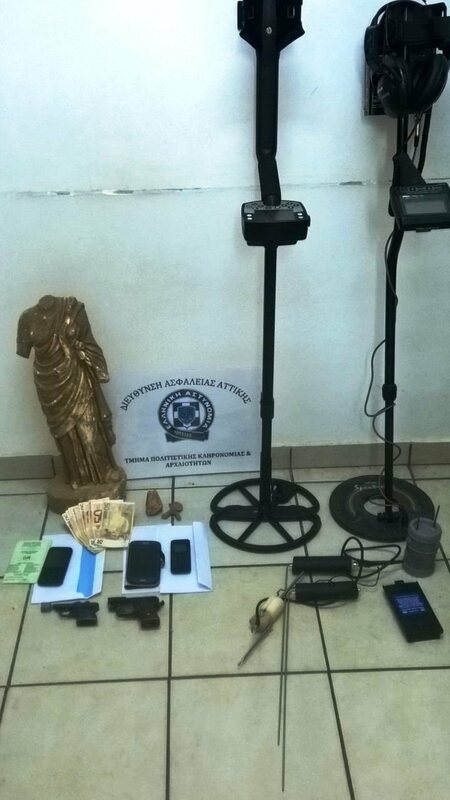 On March 23rd, officers from the Department of Cultural Heritage and Antiquities of the Attica Security Directorate arrested three individuals (aged 44, 48 and 57) in Sparta for illicit traffic in archaeological material. 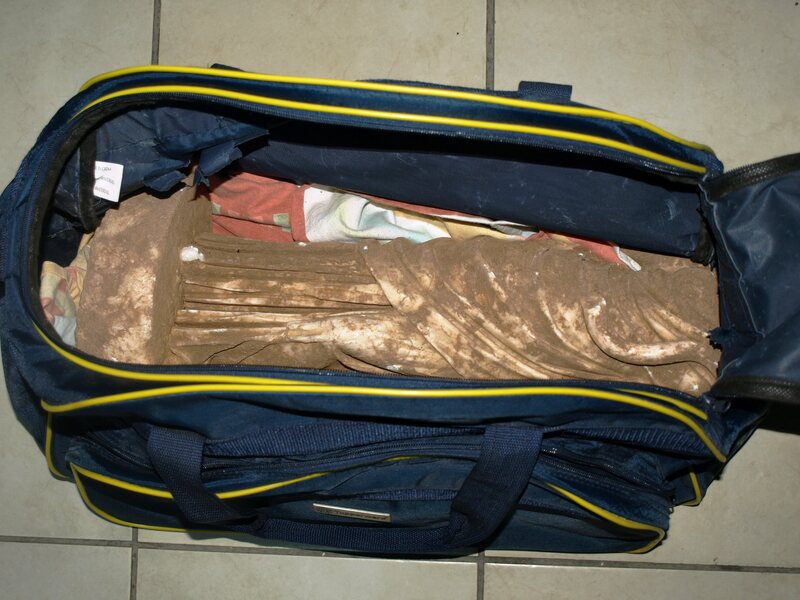 Inside a van owned by the 57-year-old police found a Hellenistic-era marble statue stuffed into a duffel bag. The figure is missing her head and one arm, but is believed to be a representation of the goddess Hygieia. It is 55cm (22 inches) high including the plinth. According to the assessment of state archaeologists from the Ephorate of Antiquities of Lakonia, the statue is of significant value in terms of archaeological importance and unquestionably qualifies for protection of the statute establishing standards for the protection of Greek antiquities and cultural heritage. It is also of significant market value, and there is evidence the traffickers were already arranging its sale with an unnamed foreign buyer. According to Greek law “all antiquities on land and sea are the property of the State, which has the right to investigate and preserve them”. There are stringent fines and other punishments for people who intentionally or otherwise keep, sell or remove artifacts without telling the authorities. Other objects were seized in the investigation at the homes of the suspects. 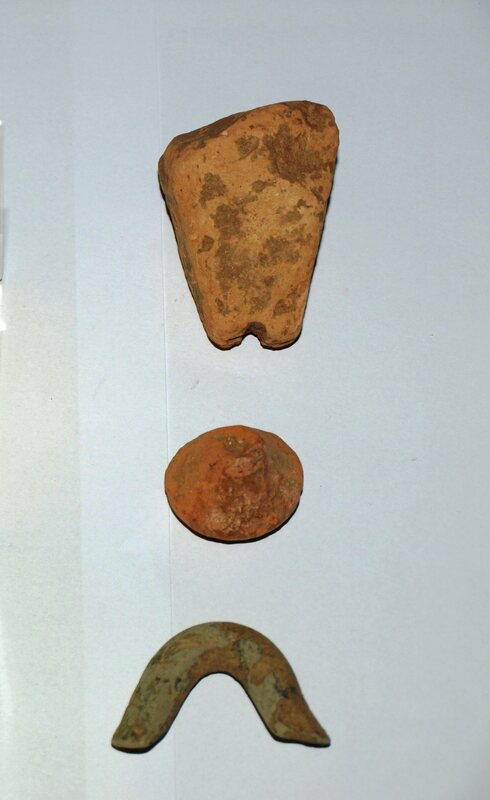 Three of them were artifacts: an ancient loom weight, black-glazed grip from a Hellenistic vessel and a knob from a Roman-era lid, all of some archaeological value. 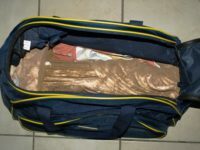 The rest were tools of the trade — two metal detectors, two dowsing rods, two flare guns, eight mobile phones, pepper spray — and cash in the amount of 800 euros. This entry was posted on Thursday, March 29th, 2018 at 12:02 AM	and is filed under Ancient, Looting. You can follow any responses to this entry through the RSS 2.0 feed. You can skip to the end and leave a response. Pinging is currently not allowed. Those dowsing rods look a whole lot flashier than the ones I once made out of welding rods. I’m curious what caused the police to search a bag within a van, but I suppose it’s best for them to keep those details more hidden so future looters can make the same mistakes and get caught. The how-to article I read many years ago suggested using wire from coat hangers — just un-twist it, bend it, and off you go. I suppose those coat hangers are no longer in everyone’s closets. Didn’t the police find a flat earth catalog also?